Seven people circle around the brightly colored piece of cloth, holding its edges and shaking it to the beat of I Love You For Sentimental Reasons. “What does this fabric remind you of?” asks Natasha Goldstein-Levitas a Philadelphia, Pennsylvania based registered dance/movement therapist who reguarly works with these memory care residents. “We’re shaking out a tablecloth,” one woman says, giving the cloth a brisk tug. “We’re hanging clothes outside to dry,” says another. “We’re cutting up onions for potato salad,” says another. “When might we eat potato salad?” Natasha asks. 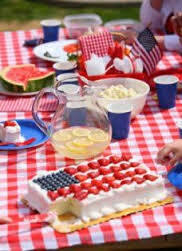 “A Fourth of July picnic,” a man answers. She concentrates on simple and focused movements, such as opening and closing the fingers and stretching arms overhead. She narrates every movement and frequently reminds people to breathe deeply. Sometimes food is integral to the movement. 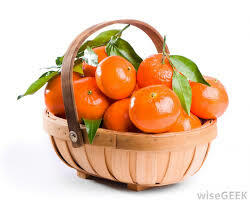 Natasha brings in a basket of Clementines and asks each person to choose one. They hold the fruits, gently squeezing them. They notice how each piece of fruit is unique. Natasha asks questions, such as. “What other orange objects can you think of? What does the aroma remind you of?” While they talk, they massage their arms by rolling the Clementine’s up and down. It’s great to see the techniques being shared so that others can learn the importance of discovering ways to unlock the memories and senses of those with dementia. I really like the idea of fragrance used in conjunction with movement and touch.